— Supplement your diet with multi-vitamins to stay healthy and illness-free. — UCO performing arts tickets on sale. Learn more. 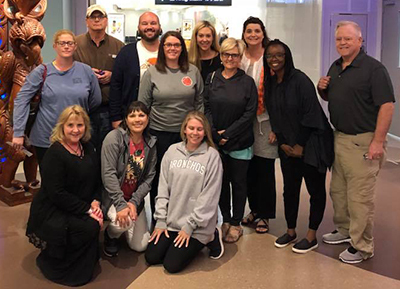 Broncho Travels — Faculty and students from the College of Education and Professional Studies were all smiles when they arrived at Auckland International Airport in New Zealand. The group learned about the unique culture of the Maori people and visited the University of Waikato and schools in Hamilton and Tauranga. The tour was May 31-June 19. The Child Study Center has openings in its afternoon class that meets from 1-4 p.m. Monday-Thursday, beginning Aug. 20. The class accepts children ages 4 and 5. If interested, contact Cristy Smith by email or call 405-974-5788. The U.S. Women’s Sitting Volleyball Team, based at UCO, took home a third-straight silver at the World Championships July 21 in Netherlands. The U.S. Men’s Sitting Volleyball Team, also based at Central, placed eighth at World Championships, its best result ever. Read more. The UCO Oklahoma Center for Arts Education (OCAE) and Department of Dance brought dance and music excerpts from Disney’s “The Descendants” to the stage during the annual, weeklong Dance and Down syndrome Music Theatre Camp. In its 11th year, the camp offered attendees daily music classes and dance and acting rehearsals, within a fun and safe environment. Read the press release. Effective fall 2018, the tuition waiver benefit policy rules have changed. The new policy changes the benefit from a defined dollar amount to the value of eight undergraduate credit hours each academic year. Employees have flexibility on how they choose to apply this benefit to each semester and may use all of the waiver at once or spread out the credit over one academic year. The current value of eight undergraduate hours for academic year 2018-19 is $1,728.40. Taxation may apply. See taxation rules. All applications must be emailed to tuitionwaiverbenefit@uco.edu. No paper applications will be accepted. All applications for the fall 2018 semester are due by noon Friday, Aug. 10. For more information about the tuition waiver benefit and new taxation guidelines, visit the Human Resources website.